A Discount on all Stampin’ Up! products – 20% off retail price! A chance to meet tons of other creative people at Stampin’ Up! events and in our online communities. Share your love of stamping and get paid to do what you love! If you want to make money, you can and you can do it all on your terms—your schedule, your way. Sneak Peeks and First Access to New Products – Be the first to see new products and have opportunity to get them before anyone else! Demonstrators can now look through the NEW 2019-2020 Annual Catalog… and order from it starting May 2! 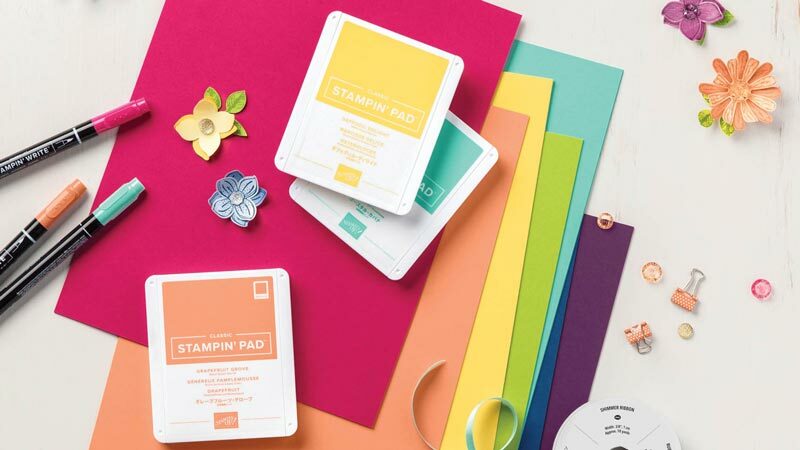 The starter kit includes everything you need as a Stampin’ Up! demonstrator AND you even get to pick the stamping supplies that come in it! You choose $125 worth of stamping supplies for only $99+ tax. Shipping on your starter kit is FREE! I became a Stampin’ Up! demonstrator in 1999, shortly after discovering a love for rubber stamping and card making. When I first started I had to drive to local meetings to learn how to make cards. I was clueless when it came to stamping and card making! Now it’s easy to learn all of the latest techniques from the comfort of your own home. For years I drove all over southern Wisconsin to teach other people how to make cards too. It was fun, but very time consuming. Everything is so much easier now! These days I’m a wife and homeschooling mom of two daughters (one middle school, one high school). I run my business from the comfort of my own home and teach card making online. I signed up just for the discount and you can to. If you don’t ever want to share your love of stamping with others and you just want to keep it all to yourself, that’s okay. But let me warn you. Here I am 19+ years later and I still love being a Stampin’ Up! demonstrator. No matter what your goals are as a demonstrator I’m here to help you. Your goal might just be to save money on your stamping supplies, but it may be to earn a little extra money to pay for dance classes or a bit more money to cover your monthly car payment. The sky is the limit! In 2018 I was recognized as #8 in Recruiting, #14 in Leadership, #20 in Sales and #24 Overall Demonstrator in the US. I’ve helped over 300 demonstrators get started on their Stampin’ Up! journey and I’d love to help you too. My team of demonstrators is one of the kindest, most encouraging groups you could ever be a part of. Every day you’ll find someone in our Facebook group to answer your questions quickly. You can participate in our Card Challenges for a chance to show off your creativity or you can just take a look at the cards that are shared for a little inspiration. Come on, you know you want to join us! $300 per quarter to stay active, so it evens out to about $100 per month. What kind of discount would I get? Can I join just for myself and not sell to other people? Do I get to choose the stamping supplies that come in my kit? Yes! The starter kit is completely customizable. You choose $125 worth of stamping supplies for only $99 + tax. If someone who does not live near you joins, how do you help them? The same way I help demonstrators that do live near me! All support/training is done via Facebook, email and the demonstrator-only section of my blog. Plus you get a FREE membership to my One Sheet Wonder Card Club ($15/month value). We’d love to have you join our encouraging group of demonstrators! Can I really make money as a Stampin' Up! demonstrator? Yes! How much you make is up to you. Many demonstrators use their income to support their stamping habit, but there are also demonstrators that make as much or more than they did at their full-time jobs. Okay, I'm ready to get started. What do I do now? Pick what stamping supplies you’d like to get in your kit and click the button below to order your starter kit.